This fall, The Music School of Delaware’s faculty member Marty Lassman leads new jazz choirs for both teens and adults. We caught up with him for a sneak peek at what students can expect. For more information on jazz choirs or other classes and lessons at The Music School of Delaware, call 302.762.1132. Can you tell us the differences between leading a jazz choir versus a traditional choir? Are there different techniques for singers to learn? Firstly, thanks for these questions! I should realize that what seems obvious to me is sometimes not as intuitive for non-jazzers. Leading a jazz choir has many similarities to leading a traditional choir, except that in the performance, the focus is on the singers not the director/conductor. The ‘European-based’ method of choirs that we have inherited in our country focuses on how the conductor will interpret the written score. However, the U.S. model is built upon the concept of independence and freedom, so jazz allows the singer/performer to interpret the music based upon their own experiences and level of expertise with the genre. The novice can sing simple riffs and show off the beauty of their voice. The more experienced jazzer can also use scales, licks and sequences to take the listener into unexpected and delightful aural places. As for the singing techniques, there are differing opinions. But I agree with Dr. Paul Rardin (who now directs choirs at Temple) who is knowledgeable in both traditional and jazz music. He teaches that tone production is the same for both styles with two exceptions. We sing jazz with the soft pallet dropped (unlike classical music) and with vibrato only used in solos and only for a deliberate effect. There are techniques that we all know from pop music – which originated in jazz – that we use, but basic tone production remains the same. Some directors prefer a brighter vocal tone but I do not. I prefer a traditional non-vibrato choir sound so we can sing in tune on ensemble sections. Can you give us examples of music you plan to include in the choirs' repertoires? I am waiting to see what our voicing will be before choosing repertoire – we can adapt to anything – but I intend to include newly composed as well as standard pieces. Members can expect to sing in swing style, Latin (e.g., Bossa Nova) and funk. No one needs prior experience. The complexity of the music will be based upon the level of musicianship we have in the ensembles. We may also sing a few standards in unison, which will provide more opportunities for improvisation. What are the main things that students should know when preparing to audition for the jazz choirs? I’ll be listening for the ability to sing in tune and rhythmically. Our unisons must be true unisons. I’m also listening for beautiful tone production. I’m not going to be upset if someone sings wrong notes or words, as long as those notes are in tune and on time. I’m not asking for improvisation as a requirement. Most non-jazzers are terrified to improvise. It is not simply ‘singing what you want.’ There are flexible rules and learnable techniques. I will teach easy ways to get started, so that each singer’s confidence and abilities will grow. I tried to find the most non-threatening way to audition singers. The singer gets to practice as much as they wish and create their audition ‘tape’ as often as they wish until they are satisfied. There are several specific song selections I’d like singers to use, and all can be found on YouTube. (A list of the songs can be found on the Music School’s Facebook Event for Auditions. Singers can find sheet music for the songs online and can also find recordings, including ones on YouTube, of the songs. Then, set your recording device – a smartphone, tablet, computer or actual recording machine like Zoom – where it can hear (and optionally, see) you sing while we also hear the YouTube clip. (The clips I chose have the words on the screen to make it even easier!) It really is fun! Then just email the recording of your singing (with the YouTube clip in the background) to the Music School. What are your goals for the two choir groups? What are some of your favorite works for jazz choir? More than favorite works, I have favorite arrangers. I am fond of Paris Rutherford’s arrangement of Autumn Leaves because it is challenging, is a great teaching piece and sounds even harder than it is. I also enjoy working on any arrangement written by/for the New York Voices but those are intended for advanced choirs. I also like Rosana Eckert’s arrangement of Sandu because the composer, Clifford Brown, lived in Wilmington and is buried in a cemetery across the street from Cab Calloway School of the Arts. Local roots! What is your best advice for young or "emerging" singers to improve their craft? Learn classical music. The foundations for every genre of the Arts – music dance, visual art, etc. – are all based on fundamental techniques taught by performing, recreating or studying the works of the masters. Additionally, all the fundamentals of music – pitch, rhythm, tone, technique, etc. – are learned through traditional choir work. However, musicians living in our contemporary world also benefit from being versatile enough to do perform any style of music, including jazz and pop. Martin (Marty) Lassman received his Bachelor of Music Education with a trumpet concentration from the University of Delaware and his Masters of Education with a piano concentration from the University of Iowa. His faculty instruction resume includes work with H.B. DuPont Middle School, Talley Jr. High School, Wilmington Friends School and Cab Calloway School of the Arts. His teaching experience includes band, general music, jazz band, vocal music and jazz choir at Cab Calloway. He is the Past President and Treasurer of the American Choral Directors Association and served on the Jr. High All-State Chorus Committee for violin. Here’s a solid Wilmo recipe: Start with a cool venue. Add one comedian and a variety of talented musicians in different styles, mix in an energetic crowd. When done correctly, this concoction yields one great evening of entertainment. 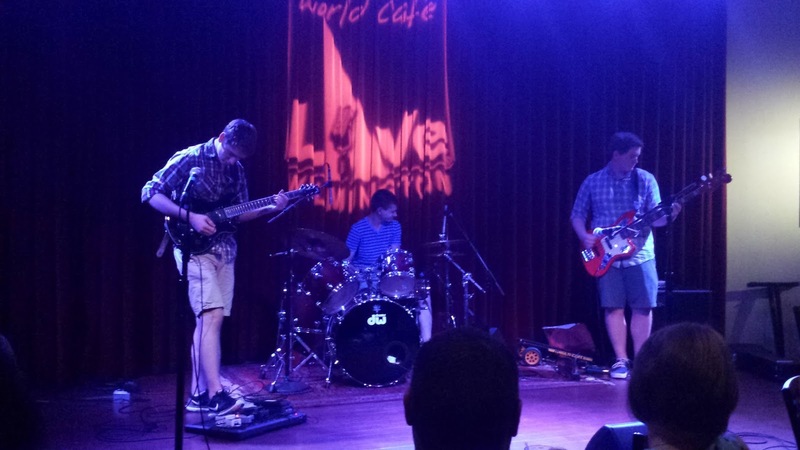 On August 5, Gable Music Ventures cooked up this eclectic blend of talent as part of Wilmo Wednesday at World Café Live at the Queen. Melissa Bernard does an excellent job of entertaining while the acts set up and tear down, making connections with the audience and keeping the evening on track. NOTE: This is not an open mic night — the evening is a curated showcase of talent from all over the mid-Atlantic region. Davey Dickens, Jr., sounds like a cross between Steve Earl and John Prine — an interesting blend of hard-edge country with laid-back folk. Nave, on the other hand, brought a sophisticated hip-hop performance to the stage. Gable's own Jeremy Hebbel went beyond his musical talent and shared a part of his soul with the audience. 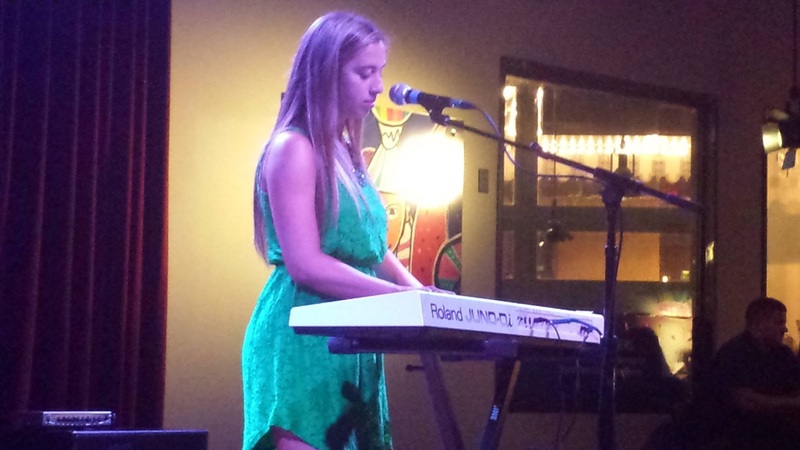 that had many in the audience in awe, to Danielle Cuoco, a 15-year-old who seems ready to take on the music world with gusto — we saw a glimpse of what the future of music can look like, and it is good. 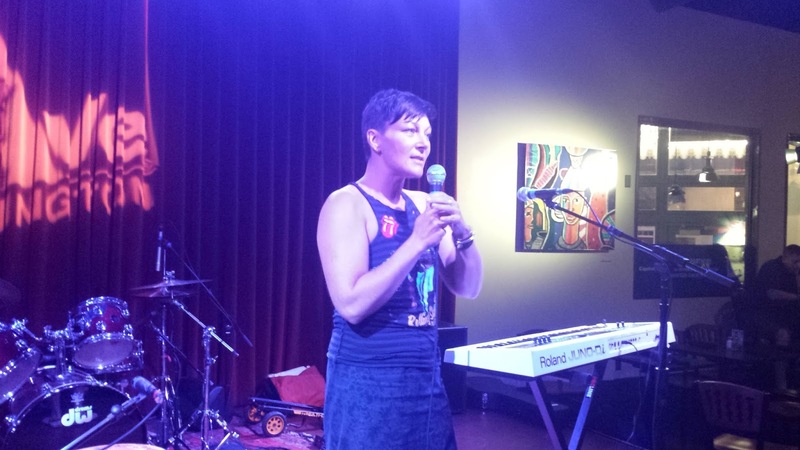 Wilmo Wednesday is a place for musicians to connect with audiences in a casual, intimate setting and for audiences to enjoy a variety of talent, from the genres they already enjoy to some they are learning to appreciate. 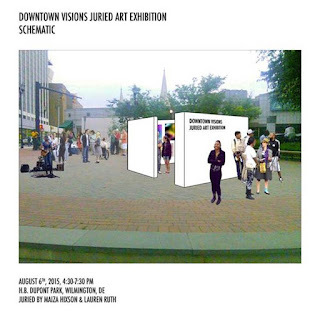 A rendering of the pop-up gallery to be created in HB DuPont Plaza. In keeping with this summer's "In the Plaza" arts- and entertainment-related happenings, Downtown Visions is sponsoring a free-standing art gallery and juried exhibition on Thursday, August 6, 4:30-7:30pm in HB DuPont Plaza (corner of Delaware Avenue and Washington Street) in downtown Wilmington. By constructing a professional art venue in the park, The Shaft Space -- an artistic and curatorial collaboration between regional artists Maiza Hixson and Lauren Ruth -- seeks to generate civic dialogue, community and corporate engagement in the arts. Artists from all backgrounds were invited to submit up to three works for consideration. As a result, approximately 40 Wilmington artists will display their work in the pop-up gallery at the Plaza. Artists' names to be announced soon. If you have questions, email theshaftspace@gmail.com or contact Maiza Hixson at 302.415.4674.